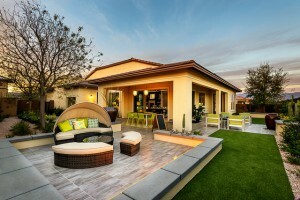 Exterior view of one of the home styles at Trilogy at the Polo Club. For Baby Boomers who planned well, invested wisely and generally lucked out on a primary residence, there’s little incentive to sell the family home and move on in retirement. For many others, knees and knuckle joints bark louder with the chill of each passing winter. The path to the second floor bedroom isn’t a staircase but a hazard. And with kids grown and gone, the house represents a pile of cash, money that might be leveraged into a more comfortable lifestyle. It’s an old story, downsizing to a condo or small home in a retirement community woven around a modest golf course. But with a 21st century twist, the newer developments are clearly not your grandparent’s pasture – – places with upscale and open floor plan designs, restaurants more about cuisine than food, and well-organized activities and events. Trilogy is a Shea Homes brand name, and it comes with the promise of “Active Lifestyle Communities.” Their latest development is Trilogy at The Polo Club, just down the road from Palm Springs in California’s Coachella Valley, and hard by the eponymous Empire and El Dorado Polo Clubs. Offering 13 models of architecturally attractive homes – – with prices ranging from the mid-$200,000 to $800,000 – – this is a gracious “all-ages” gated community, with several select neighborhoods reserved for those 55 years old and over. Designed to look and feel like a resort, the gated community will ultimately have about 800 to 1000 homes. I had a brief look at this new development in early December, during the 15th annual Media Golf Classic, which was being held in Greater Palm Springs for the first time. Trilogy sponsored a reception at property, and managed to cook heavy apps for about 100 people in the kitchens of just two model homes, which says much about those facilities. Although it was well past dark and outdoor details were hard to envision, the interior spaces were gorgeous. 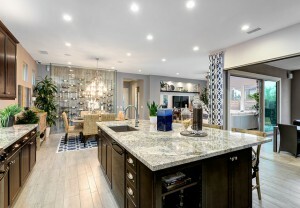 Spacious and featuring fine materials, Trilogy’s kitchens are a highlight of the development. areas, including a luxury resort pool with cabanas, a 25-meter lap pool and a stand-alone fitness pool. The restaurant will be called June Hill’s Table, named for a Coachella Valley pioneer who was a nurse, physician and who, with her husband, ran the Southern Pacific Railroad Depot, which at the turn of the previous century was the social center of Palm Springs. Featuring locally sourced produce and showcasing “New School Cooking” of Executive Chef Kevin Land, it will open in the spring of 2016. Adjacent to the restaurant is a showcase kitchen, to be used for cooking classes, dinners prepared by visiting chefs and for private functions. The development will also have tennis and pickleball courts, community parks, walking and biking trails, and a lakeside stage that will likely host concerts. Golf? Well, it’s offsite, but nearby. Indeed, there are more than 130 courses, about half public and half private, within a 30-minute drive. Trilogy is only a few minutes from the La Quinta Resort & Club, features two great Pete Dye courses, the Dunes and the Mountain. Not far away is Silver Rock Resort, a sublime Arnold Palmer designed tucked against the Santa Rosa Mountains. Nearby too is the Indian Wells Golf Resort, with pair of Troon-managed tracks, the Players and Celebrity, each of which is a delight. The property is also only a few blocks from PGA West, including its renowned Stadium Course. Also close by is the Indian Wells Tennis Garden, the site of the BNP Paribas Open, which after Grand Slam majors is perhaps the most popular event on the professional tour, for both players and fans. Held in 2016 from March 7th through the 20th, it’s a certified happening in the valley. 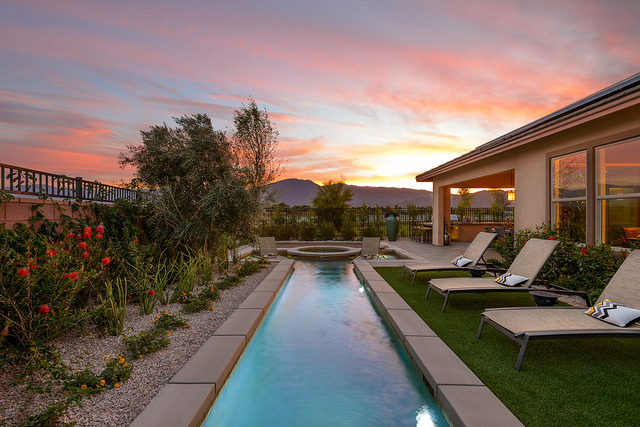 Some of the Trilogy homes feature private pools. Speaking of, there’s a reason why Hollywood’s elite started flocking here from the 1930s onward. The winter weather is superb. And the resort vibe was cemented in the mid-century architecture aesthetic that prevails in most of the valley cities, and in particular at old town Palm Springs. And Shea Homes has paid homage to that in the Polo Club development. The smaller homes are among Trilogy’s most popular floor plans, featuring large rolling walls of glass that connect indoor and outdoor living spaces. With the generous use of marble counters and high quality floor tiles, these homes are also designed to be energy efficient. In fact, one option is a SheaSolar home, which generates enough power to make summer air conditioning self-sufficient, not an insignificant thing come August.